V.com weekend vote: What is your chin rest set-up? 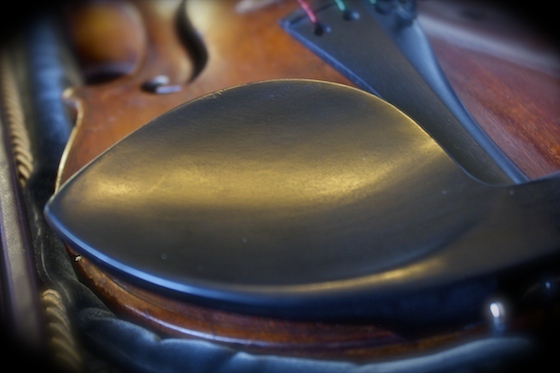 Chances are that your violin came with a chin rest, but is it the best chin rest for you? Louis Spohr designed the first chin rest, which was center-mounted, over the tailpiece. The chin rest above is center-mounted, but the cup is to the left of the tailpiece. These days, one has a huge range of choices. If you are planning to make a change, you'll likely need to try a range of different rests to find the best fit. That probably means going to a violin shop that carries many chin rests, so you can try them in person. A chin rest should suit the length of your neck as well as the shape of your jaw. Besides height and shape, you also need to determine whether you want the chin rest placed right over the tailpiece, or to the left of the tailpiece. How is your chin rest set up? My instruments previously had side-mounted models, left of tailpiece. About 9 years ago, I tried the Flesch flat model, centered over tailpiece, on each of them but eventually decided that these were too tall for me. The lower-set left-mounted devices turned out to be better after all -- currently 2 Dresdens and 1 Teka medium. The side mounted chin rest hurts the sound of violin, since it is mounted on the side rib, that squeezes the face and back board and a part of the rib, impades the vibration. I use both side-mounted and over-the-tailpiece but on the other side (bow left). All home made. Shaping contact to the fiddle can be important. Side mounted Frisch and Denig raised chin rest (to compensate for no shoulder rest) on my violin, and a center mounted raised chin rest on my viola. Ohrenform on every one of my instruments. part of the bump, but my teacher warned me that the wood (ebony) is very hard. Kreddle! It has made a big difference for me. Ohrenform. It lets me move my chin around a lot, and has helped me break a bad habit of clamping too hard with my chin. I don't like a lot of chin rest - (jaw rest) and a lot of the time, I am hardly using it - I sometimes use a shoulder rest and sometimes I don't - I have thought about removing the jaw rest from one of my violins to see how I like it -. I don't like a high rest because I like to move and the higher the more scrunched and permanently stuck in place I feel. I thought about the over the tailpiece type and it feels like a big cyst, but I would just as soon remove the rest and put my jaw on the tailpiece as needed. One of my instruments has a tiny chin rest and it is oh, so comfortable! I switched from the Kun to the PolyPad, now I have to reconsider my chin rest. I'd like something that helps me move my chin nearer or across the tail piece so that the button can go into my neck where it belongs. but I have tried Flesch models and they seem too high (Berber even higher). Suggestions would be appreciated. Kreddle ... yeah, but that's a pretty expensive experiment! I repair violins for a living. Most damages I see are from side mounted chinrests. There is no blocking inside the instrument for the clamp, and they eventually crush the instrument. I have developed a low profile over the tailpiece chinrest to help preserve the instrument. After trying about a zillion chin rests over about the last 58 years I am currently using a Wittner and I recommend it as a first try for my students. and it is very easy for anyone to mount without damaging the violin. Someone in the past over-tightened the clasp on a to-the-side mounted chin rest, causing the bass-side lower bout rib of my violin to permanently buckle slightly. For this reason I now use a center-mounted rest -- benefitting from the support the end block provides. I've had to customize the rests I've tried so far by reducing their height and footprint area, and by whittling them to a comfortable fit. The bass-side lower bout rib of my fiddle is permanently buckled from chin rests over-tightened by prior owners. For this reason, I've always used across-the tailpiece rests -- they have the support of the end block. All of these rests I've tried so far require modification by reducing their height (from the top surface in), as well as their footprint area. The feet should touch only the edge out side the purfling. In the process, I also customize the fit. I got my violin cheaper because the bass-side lower bout rib is buckled from generations of too-tight chin rest clamps. Better to clamp above the end block and do what you must to get the rest comfortable after that. Most over-the-tailpiece rests seem to come with too much footprint area and too much height, so they must be heavily modified. Best to do it, though. In many cases the thing isn't comfortable to begin with anyway, so re-carving from the top down brings the surface lower and gets a better fit. Can't take too much off from the foot end, of course, or you'll bring the arch down onto the tailpiece. The size of the footprints can be reduced so they rest only on the edges above the ribs.